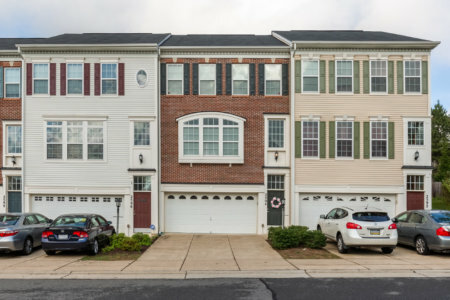 Two car garage townhouse Woodbridge Virginia For Sale $355,000. Buyer loss can be your gain. If you are pre-approved for $355,000 for a fee simple townhouse ( no condo fee) then hurry. Call us today to see it. You will get a 2300 square foot three finished level townhouse with a rear yard, patio and room for up to four cars. Think visitors! Yeah, finally a townhouse community that has extra visitor parking and you get a two car garage and a two car driveway. Best of all you get gleaming hardwood floors, a center island kitchen, access to the rear yard from breakfast room( makes it easy to let the dog out!) and a fantastic open concept design. The kitchen has hard surface counters, black appliances, lots of cabinets and drawers, and a breakfast room. Upstairs you will find three bedrooms. The master has two closets and a large master bath, the laundry room with washer and dryer are on the bedroom level as well. Down stairs you will find a good sized rec room with full daylight window. Makes that space light and bright. Access from the garage comes into this room. This map gives you an idea of where the home is.